Utes senior forward David Collette swatted a shot by Stanford’s Josh Sharma with 3:58 remaining, his third block of the night. Collette celebrated by pounding a fist against his chest after the ball sailed out of bounds. Unfortunately for Collette, the exuberance resulted in a technical foul and him fouling out. Fortunately for Utah, its lead had already reached 23 points on the way to a 75-60 win in the Jon M. Huntsman Center on Thursday night. Utah, led largely by a contingent of seniors, earned a win over a Stanford team that came into the day tied for fourth place in the Pac-12 Conference standings. The Utes got a shot in the arm from four senior starters — Gabe Bealer started along with Collette, Rawson and Bibbins — playing with a sense of urgency. The Cardinal were coming off of a 96-point effort in a win against Oregon that included a 50-point first half last week. Thursday, the Cardinal didn’t reach 50 points until less than six and a half minutes remained. Collette’s three blocked shots were part of a season-high 10 for the Utes (14-9, 6-6) on a night when they held the Cardinal (13-12, 7-6) to 35.8 percent shooting. The Cardinal start three players 6-foot-8 or taller, including preseason All-American forward Reid Travis, who is 6-foot-8 and 245 pounds with bulging biceps and muscular physique that makes him look he’d been carved out of granite. However, the Utes controlled post play on both ends of the floor and outscored the Cardinal 36-24 in the paint. Despite the Utes coming off of one of their worst offensive performances of the season in which they scored a season-low 55 points at Colorado, Krystkowiak’s message leading up to the game was that offense would take care of itself if they locked in on defense. He proved prescient as the Utes shot 50 percent from the field, their highest percentage against a Pac-12 opponent this season. The Utes led by 12 at halftime, 40-28, and Bibbins, who’d scored just seven points last week at Colorado, scored 11 first-half points while going 4 for 5 from the field and making all three of his 3-point attempts. The lead reached 20 points after Collette used an up-fake to create space under the basket and threw down a one-handed slam, Barefield drove the lane for a layup and Parker Van Dyke came up with a steal near midcourt and converted a layup to make it a 64-44 lead with 9:37 remaining. • The Utes earn a win against a Stanford team near the top of the Pac-12 standings. Seniors David Collete, Justin Bibbins and Tyler Rawson serve as catalysts for the win as they enter the final month of the regular season. 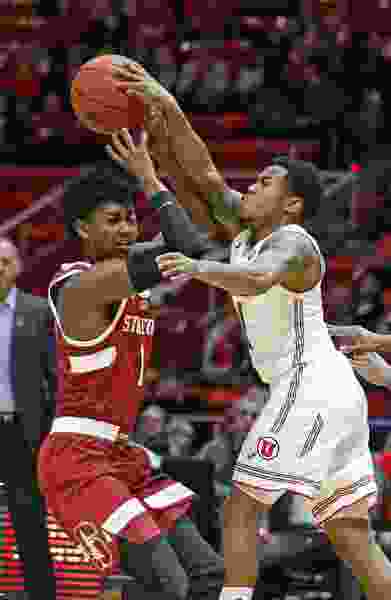 • Defense leads to offense as Utes hold Stanford to 60 points and also shoot 50 percent from the field.